The odeum was a small covered theater or roofed hall for musical competitions and rhetorical displays. At Corinth the Roman odeum was characterized by a cavea or seating area, an orchestra, a skene building, two parodoi or covered entrance corridors, a scaenae frons and an open court. Before the construction of the odeum, part of the site was the location of a quarry of oolitic (poros) limestone. There were a number of pre-existing roadways that intersected on the eastern edge of the odeum, and another that crossed the cavea of the odeum from east to west. There were three major phases of construction of the odeum. The original phase dates to the last third of the first century A.D. and likely dates to the Flavian period. The second phase dates to the middle of the second century A.D., likely the reconstruction of Herodes Atticus. The odeum suffered from a fire in the early third century A.D. The third period of construction dates to ca. A.D. 225 when the stage was removed and the orchestra was enlarged and renovated to become an arena. The odeum was a three-storied building and was constructed to the south of the previously existing theater. The cavea had a seating capacity of approximately 3000. The lower part was divided into four sections by three stairways. Much of the lower seating was cut out of bedrock. Each aisle ended in a vomitorium at the floor level of the second story. 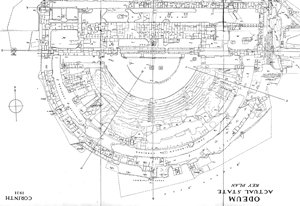 Above the first level of seating was semi-circular corridor, or diazoma. The substructure for the upper seating was built above concrete vaulting. Access to the upper seating was possible from a large stairway to the south of the structure. The ground level to the south was much higher than the ground level to the north. 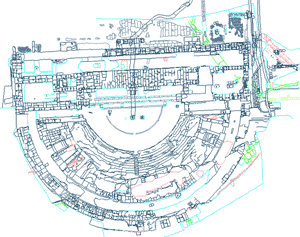 The original radius of the orchestra was 7.75 m. In the third phase of the odeum (third century A.D.), when the facility was converted into an arena, the orchestra was increased in size to a radius of 12.80 m. In this phase 8 rows of the lower seating area were cut out creating a vertical scarp with the cavea. At the same time the stage of the earlier periods was removed and the arena extended up to the south face of the foundation for the scaenae frons. Two covered passageways, parodoi, led from the east and west into the building between the cavea and the scene-building. The north facade of the original building had three doorways, each with an ornamental porch. On the second story windows admitted light into the long east-west north hall. The scaenae frons was three stories in height and was an elaborate back wall of the skene building. It served as an architectural facade including columns and niches. In the second period of construction in the 2nd century A.D. a large paved rectilinear court (39.5 X 17.0 m) was constructed to the north of the north hall. It was bordered on the east and west sides by large rooms and columned halls. Some remains of the mosaic floors remain from these rooms. Broneer, Oscar. 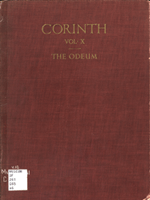 Corinth X; The Odeum. Cambridge, 1932. Tobin, Jennifer. The Monuments of Herodes Atticus. Dissertation in Classical Archaeology, University of Pennsylvania, 1991. Click on the figures to enlarge. © 1987-2008 David Gilman Romano and the Corinth Computer Project. Site design and maintenance by Dan Diffendale.